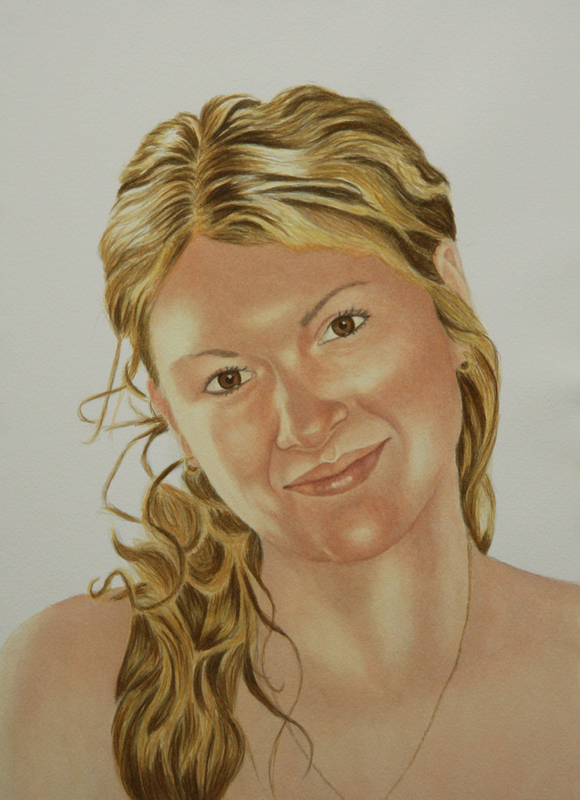 I have added just a few more layers of skin tone and softened areas on her face and I think her skin is complete. I am now focusing on the final touches on her eyes, lips and brows. Her lips are near complete but her eyes need softening, they look a little crazy right now which kills me, but it needs to be done once the paper is bone dry to avoid the risk of areas lifting off that I don't want lifted off! I also added more glowing values to her hair and once the hair is completely dry I will lift off a few highlights, mostly on the lower portion of her hair. Her ears were a touch off, thanks to the keen eye of her boyfriend. He pointed out the size was off and it was not until after staring at them for some time that an area in the photo that I had thought was hair on her right ear was in fact her ear, duh ;) So I have touched up her ears as well as adding more depth and shape to them. I still need to touch them up a bit once dry but they are nearly done. I always like to leave the ears until nearer the end as I find if I don't for some reason I end up adding way too much detail to them, I really like drawing ears, strange I know. Her jewellery has also been painted in but will require a touch more details added once dry.